Last week, the Illinois College Democrats PAC was officially launched, and in first 24 hours we raised nearly $500.Thanks to the help of the ILDCCA, Zach Koutsky and Tom Bowen, our executive board and finance director Victoria Koffsky, and our newly appointed finance council that features party leaders and College Dem alumni alike (Ben Head, Annie Kehler, Magen Ryan, Jen McMillen, and Craig Colbrook), we’re off to the races. Now, here’s why it matters that College Democrats have a well-funded operation. The Democratic Party will not compete without young people. The sad truth is, despite the efforts from some of the party’s biggest supporters and elected officials, the Democratic Party has failed to engage, attract, and foster this generation of leadership. It took Donald Trump and many wonderful organizations outside of the traditional party structure nationally to get people off the sidelines and to run for office. In Illinois, Representative Cheri Bustos has done an admirable job with her program to build the bench, but that doesn’t alleviate the need for real investments in young people looking to get involved in campaigns or to run for office themselves. If you need more evidence of the lack of investment in college students, just examine the DNC’s nonexistent budget for College Democrats of America. It’s not a good model for success, but in Illinois we now have an opportunity to create our own operation, paired with the state party and ILDCCA, guided by party activists, leaders, and College Democrats ourselves. Whether it be the party organization, elected official, or candidate the future of this party is dependent on fostering engaged young people by including them at the table and not just in the mailers. That’s why we’re grateful for your support over the last year and half and I am proud our working partnership is just beginning. We’re excited to have hosted several forums for congressional primaries, the race for Attorney General, and the gubernatorial race. We will continue to have candidates speak on campuses and encourage our members to get involved in this year’s primary battles. That being said, we are more concerned with building assets to compete on the ground come the general election, as well as connecting our regions and chapters for more collaboration. We also have made a point not to endorse in competitive primaries so that our attention is towards building our strength to be as impactful as possible for targeted and competitive races come the fall. We want to flip red seats blue and to help take back the house so we can take back our democracy. Our plan is simple and practical. First, we want to make ourselves known and reward chapters for working hard without any air support for years. The more we advertise person to person and campus to campus, the more people we will meet and attract them to come knock doors when we need them, especially if that is a funded operation. Then comes phase two– which I call the, “travel the state, meet each other, and raise some money” phase. As I’m calling chapter presidents and party activists on the ground, people are excited about the idea that College Democrats could actually have a budget and fund our own operations. 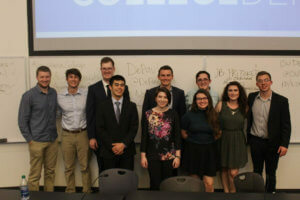 That excitement is leading to members and presidents taking it upon themselves to organize regional retreats and fundraisers to not only connect local representatives and candidates to College Democrats, but also connect College Democrats from one school to another in the same region. We are looking at having events across the state in early to mid-March and after the primary. Phase three includes fundraising for our annual convention which will follow our incredibly rewarding convention last year that featured more than 200 students in Central Illinois, memorable breakout sessions and speeches, and some good bonding between chapters. Conventions cost real money, but it’s always a valuable and needed weekend for College Democrats across the state to come together and hear from party leaders as well as from each other. Phase four is simple. Field matters, and as college students, we oftentimes knock doors and make phone calls when we have time to volunteer, or we intern and work directly for a candidate. But we want to fund our own field operation with the goal of spending $5,000 to $7,500 on field in our first election with our new PAC and finance council. We want to invest where our chapters are, such as in the 13th congressional or the 6th congressional, or with Nitika Richards, who is running for McLean County Clerk with several ISU College Democrats heavily involved. If we pick targeted races that we can win and have a good amount of college students on the ground already, we can make real impacts and track our progress in a way we haven’t before. We work with the Democratic party a lot. We’re hosting votebuilder trainings, inviting political organizations, elected officials, and candidates to campus, hosting forums, and debating fellow students all in the name of progress. For a while, I assumed progress was synonymous with the Democratic Party, but after this past election, I’ve reflected, as we all have, and I know that progress isn’t a given, and that the party isn’t always right. I believe to my core in community engagement and that people are smarter than we give them credit for. If we don’t engage new people in our politic and young people in our plans we will lose as a party. We win elections when young people are involved and turn out, and we lose elections when we don’t. We are ready to jump start this blue wave…are you?